Monographs have clear “Authoritative Version” markings for the current version just under the title information (top panel) and “Expired” markings for the outdated versions (bottom panel). Click to enlarge. The first major update to the online version of ACS Reagent Chemicals released on February 15. It included changes to the content of 35 monographs and upgrades to over 1,400 equations. We’ve also added clear indicators for current content and a permanent link to the current version, so users can bookmark one page and never have to worry they’re reading an outdated copy. Additionally, every monograph will have a Supplements and Updates box to describe any changes that have occurred—whether that particular monograph has changed or not. How have the monographs changed? The ACS Committee on Analytical Reagents continually reviews existing monographs and considers new methods and quality specifications. ACS Reagent Chemicals now contains 35 updated monographs, incorporating changes the Committee saw as necessary to keep the monograph at the peak of scientific accuracy and discovery. Because every monograph is under proactive review to ensure users get the best value, we also corrected links, punctuation, formatting, and appearance problems in over 60 monographs. Why were the equations updated? Every monograph has a box to describe changes. Even the monographs that haven’t been updated will have an entry, so users never question whether they have the most up-to-date copy. Click to enlarge. The original versions of equations were static, uncopiable images. We’ve made it easier for users to interact with equations by converting them to active MathJaxTM files. 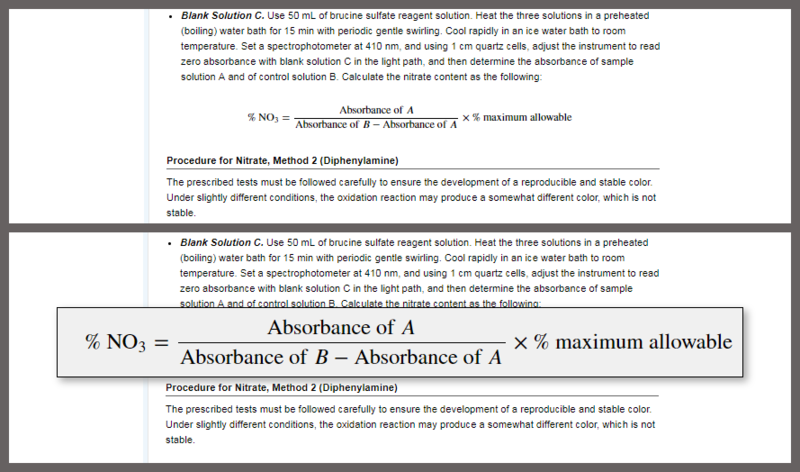 This change allows users to zoom into equations, copy parts or the whole equation into Word, LaTeX, wikis, and other software at the click of a button. Unlike other non-image equation viewers, MathJax displays well on all browsers and platforms, so users aren’t inconvenienced by specific system requirements. Want to see a sample of ACS Reagent Chemicals? If you don’t have a subscription, visit the, Acetone, and Potassium Hydrogen Phthalate monographs to experience the latest online version. 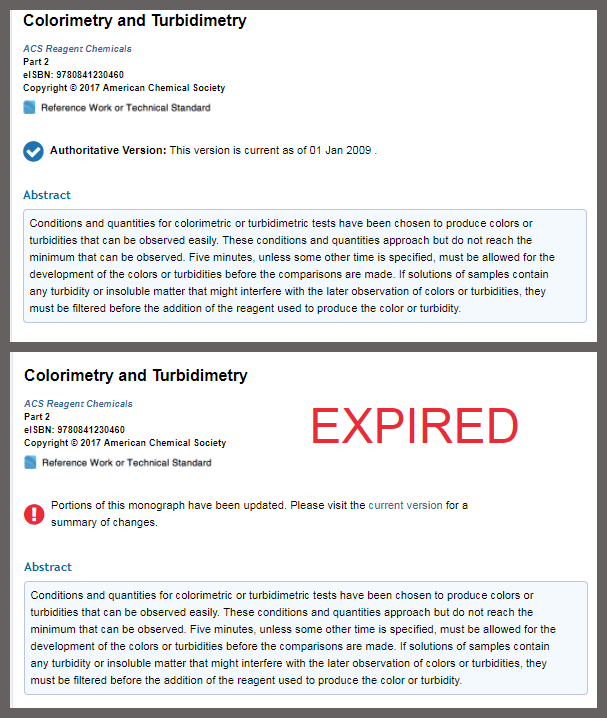 Subscribers, check out the full text of Colorimetry and Turbidimetry to view a complete example of how we archive expired content, watermark it, and integrate a new authoritative version. Every equation now uses MathJax to allow easy selection, display, zooming, and copying on any device and into any software. Visit mathjax.org for more information. Click to enlarge. Learn more about ACS Reagent Chemicals.